We studied seven Itokawa particles provided by the Japan Aerospace Exploration Agency (JAXA) as first International Announcement of Opportunity (AO) study mainly using electron and synchrotron radiation X-ray beam techniques. All the analyzed particles were collected from the first-touchdown site and composed of olivine and plagioclase with traces of Ca phosphate and chromite, and do not contain pyroxenes. Optical microscopy of these particles shows minor undulatory extinction of olivine and plagioclase, suggesting minor shock metamorphism (shock stage: S2). The electron microprobe analysis shows that olivine is Fo70-73 and plagioclase is An13-10Or5-7. The synchrotron radiation X-ray diffraction (SR-XRD) analysis of olivine crystals gives cell dimensions of a = 4.708 to 4.779 Å, b = 10.271 to 10.289 Å, c = 6.017 to 6.024 Å, corresponding to the Fo content of Fo~70 by Vegard's law. This composition matches the result obtained by the electron microprobe analysis. The olivine compositions of the analyzed particles are consistent with those of LL chondrites. The cell dimensions of two plagioclase crystals (a = 8.180 to 8.194 Å, b = 12.53 to 12.893 Å, c = 7.125 to 7.23 Å, α = 92.6° to 93.00°, β = 116.36° to 116.75°, γ = 90.03° to 90.17°) indicate that their equilibration temperatures are 800°C ± 10°C. This temperature is near the peak metamorphic temperature recorded by equilibrated ordinary chondrites. The size of plagioclase crystals and the homogeneity of olivine compositions indicate that their petrologic type is ≥5. We also analyzed plagioclase by SR iron X-ray absorption near-edge structure (SR-XANES) and found that its Fe3+/(Fe2+ + Fe3+) ratio is approximately 0.5. Such high Fe3+ abundance indicates the formation under a relatively oxidizing environment. Thus, all these analyses have reconfirmed that the Itokawa particles returned by the Hayabusa spacecraft are very weakly shocked equilibrated LL chondrites, which matches the results of the preliminary examination team. The Hayabusa asteroidal sample return mission by the Japan Aerospace Exploration Agency (JAXA) successfully returned regolith dust particles from the S-type asteroid 25143 Itokawa to Earth in June 2010 (e.g., Krot 2011). 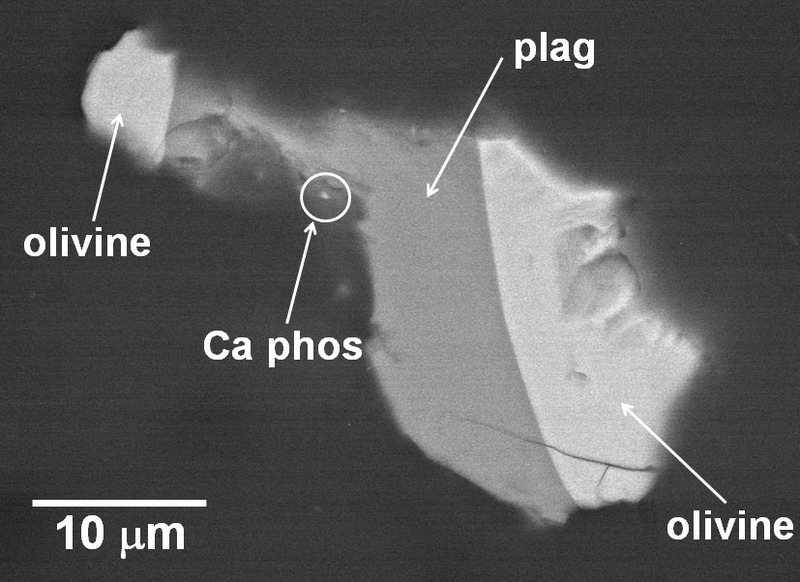 The recovered particles were carefully studied by the preliminary examination (PE) team, and the obtained results provide significant and unique information about the formation and evolution of meteorite parent bodies (Ebihara et al. 2011; Nagao et al. 2011; Nakamura et al. 2011; Noguchi et al. 2011; Tsuchiyama et al. 2011; Yurimoto et al. 2011). The mineral compositions and oxygen isotope ratios of the particles studied by the PE team are very similar to those of the equilibrated LL chondrites (Nakamura et al. 2011; Yurimoto et al. 2011), which match the spectroscopic observations by the Hayabusa spacecraft (e.g., Fujiwara et al. 2006; Abe et al. 2006; Okada et al. 2006). These studies further suggested that Itokawa is made of reassembled fragments of the interior portions of a once larger asteroid at least 20 km in diameter (e.g., Nakamura et al. 2011, 2014) and thus represents only a small fraction of the original asteroid's mass. Because of its low density and appearance, Itokawa is probably a rubble-pile body (e.g., Fujiwara et al. 2006). Such rubble-pile bodies are currently considered to be very abundant. For example, Almahata Sitta meteorite, which fell in October 2008 in Sudan, is a polymict ureilite consisting of centimeter- to decimeter-sized fragments of different types of ureilites and various chondrites (Jenniskens et al. 2009; Zolensky et al. 2010; Bischoff et al. 2010). The detailed studies of Almahata Sitta lead to a scenario involving break-up of a large ureilite parent body whose original diameter was larger than 200 km and reaccumulation into smaller daughter bodies (e.g., Bischoff et al. 2010; Herrin et al. 2010; Mikouchi et al. 2010; Zolensky et al. 2010; Goodrich et al. 2014; Horstmann and Bischoff 2014). The parent asteroid of Almahata Sitta, asteroid 2008 TC3, is considered to have been a smaller rubble-pile block of these daughter bodies in which fragments were loosely packed, as evidenced by the fact that no recovered stones consisted of more than one lithology. The history of 2008 TC3 mimics the formation history of Itokawa. Thus, it is important to better understand the formation history of such rubble-pile bodies, and the study of Itokawa particles is the key to this goal. After the PE, JAXA released an International Announcement of Opportunity (AO) for studying the recovered particles including new ones that had not been studied by the PE team. We received four new and three previously investigated (PE) particles for our research. All the particles were collected from the first-touchdown site. The new particles had the potential to contain some exotic components that had not been found by the PE study and would be of special interest if present. Even the PE samples are interesting targets because our synchrotron radiation X-ray diffraction (SR-XRD) study gives very precise cell dimensions of constituent minerals after structural refinement, which are essential to estimate their thermal history. Therefore, we have performed a detailed mineralogical and crystallographic study of these seven particles mainly using electron and synchrotron radiation X-ray beam techniques to further explore their formation with regard to deciphering the evolution of Itokawa and its original parent body. Table 1 is the summary of the particles we received. The PE samples are RA-QD02-0036, RA-QD02-0041, and RA-QD02-0049-2. RA-QD02-0036 and RA-QD02-0041 are polished sections embedded in epoxy. RA-QD02-0049-2 is directly attached to a glass fiber. The new particles we received are RA-QD02-0100, RA-QD02-0133-01, RA-QD02-0138, and RA-QD02-0179. PE, studied by the preliminary examination team; OM, optical microscopy; SEM, scanning electron microscopy; EPMA, electron probe micro-analyzer; SR-XRD, synchrotron radiation X-ray diffraction; Raman, Raman spectrometry; SR-XANES, synchrotron radiation iron X-ray absorption near-edge structure. We embedded the new particles into EPON 812 epoxy at the JAXA curation facility following the method used by Nakamura et al. (2011) and made polished sections by using diamond paste (1 μm). We polished only one place for each particle to minimize the sample loss. These samples were further polished using colloidal silica for electron backscattered diffraction (EBSD) analysis as described in the next chapter, because this technique requires better polishing than required for other X-ray and electron beam analyses. The polished sections were first observed by optical microscopy and then analyzed by field emission gun scanning electron microscopes (FEG-SEM) equipped with energy dispersive spectrometers (EDS) and EBSD detectors (Hitachi S-4500 at Department of Earth and Planetary Science, The University of Tokyo and Zeiss Supra 55VP Schottki at NASA Johnson Space Center, TX, USA). We obtained forescatter electron (FSE) images and EBSD maps using the Zeiss SEM. The FSE images are dominated by orientation contrast and give grain and subgrain structures. Then, these particles were analyzed by electron microprobe (JEOL JXA8900L at Department of Earth and Planetary Science, The University of Tokyo) using well-characterized natural and synthetic standards. For all phases, the accelerating voltage was 15 kV. For olivine, the beam current was 12 nA with a focused beam. For plagioclase, a defocused beam (5 to 10 μm in diameter) was used with a beam current of 6 to 8 nA to minimize volatile loss. We employed a ZAF correction for the data reduction of the electron microprobe analysis. The detection limits by electron microprobe analyses are 0.02 SiO2, 0.02 Al2O3, 0.05 TiO2, 0.04 FeO, 0.02 MnO, 0.02 MgO, 0.02 CaO, 0.02 Na2O, 0.02 K2O, 0.02 Cr2O3, 0.04 NiO, and 0.04 P2O5 (wt%) for olivine and 0.03 SiO2, 0.03 Al2O3, 0.12 TiO2, 0.05 FeO, 0.03 MnO, 0.03 MgO, 0.03 CaO, 0.03 Na2O, 0.03 K2O, 0.03 Cr2O3, 0.07 NiO, and 0.05 P2O5 (wt%) for plagioclase. For a few polished sections, a micro-Raman spectrometer was employed to confirm the constituent phases and document their crystallinity (Horiba Xplora at Mineral State Collection, Munich, Germany). The range of wave number for Raman is 50 to 2,500 cm−1. The polished sections and RA-QD02-0049-2 were also analyzed by SR-XRD using an energy scanning method at BL37XU, SPring-8. The beam size is approximately 1 μm. Details of the SR-XRD measurement are described in Hagiya et al. (2010). For plagioclase in RA-QD02-0100 and RA-QD02-0133-1, we performed SR iron X-ray absorption near-edge structure (XANES) measurements to determine the presence of Fe3+ at BL-4A, Photon Factory (PF), High Energy Accelerator Research Organization (KEK, Ibaraki, Japan) using the method described in Monkawa et al. (2006) and Satake et al. (2014). The SR X-ray beam size was approximately 5 × 6 μm. The optical microscopic observations revealed that most Itokawa particles were composed of multiple phases, but olivine and plagioclase are dominant. We found that the shock metamorphism of all polished sections was minor and estimated their shock stages to be S2 (very weakly shocked; Stöffler et al. 1991) because of the presence of minor undulatory extinction of olivine and plagioclase. However, the samples are much smaller than regular thin sections used for meteorite shock degree estimation and may be biased. RA-QD02-0036 is composed of olivine and plagioclase. We analyzed both phases by SR-XRD. The obtained diffraction patterns are sharp, and we obtained the following cell dimensions (Figure 1): olivine a = 4.7788(9) Å, b = 10.271 (4) Å, c = 6.0167 (8) Å. These values give forsterite contents of Fo67.2, Fo73.7, and Fo68.0, respectively, by Vegard's law (Akimoto and Fujisawa 1968), and the average value (Fo68.9) is close to the composition obtained by electron microprobe analysis (Fo70). The analyzed plagioclase grain gave cell dimensions of a = 8.180(4) Å, b = 12.53 (9) Å, c = 7.125(3) Å, α = 93.00 (18)°, β = 116.36(5)°, and γ = 90.17 (17)° (Figure 1b). Micro-Raman analysis also confirmed the presence of olivine and plagioclase, and the sharpness of the Raman peaks indicates good crystallinity. Optical photomicrograph and SR-XRD images. (a) Optical photomicrograph (reflected light) and the obtained SR-XRD image from olivine in RA-QD02-0036 taken at an SR beam energy of 30 keV. Numbers in the diffraction image are reflection indices. The SR beam size was approximately 1 μm. 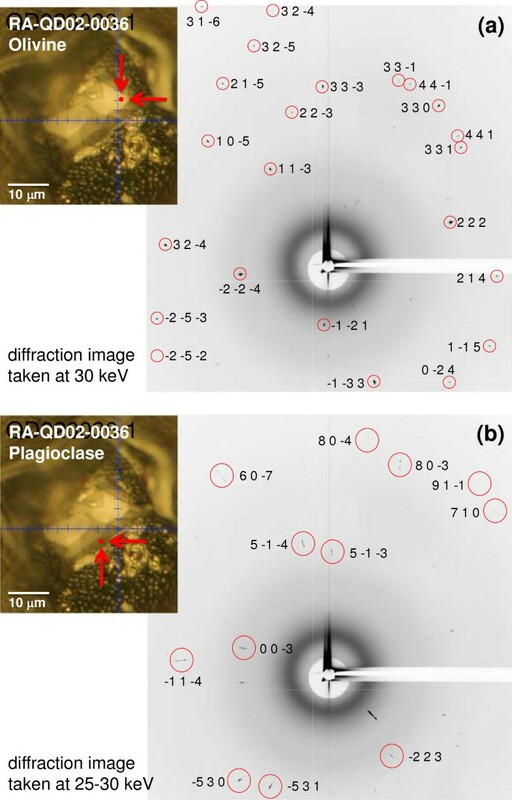 (b) Optical photomicrograph (reflected light) and the obtained SR-XRD image from plagioclase in RA-QD02-0036 taken at an SR beam energy of 25 to 30 keV. Red spots indicated by red arrows are analyzed spots. Red circles with indices show diffraction spots used for structural refinement. This PE particle consists of approximately 80% olivine and approximately 20% plagioclase. There is an approximately 5-μm pit near the center made by an ion probe measurement by the PE team (Yurimoto et al. 2011). Olivine is a single crystal as revealed by SR-XRD and EBSD analyses (Figure 2). The SR-XRD analysis yields the cell dimensions of olivine of a = 4.7745 (13) Å, b = 10.2780 (11) Å, and c = 6.0208 (5)Å. These cell dimensions correspond to an olivine composition of Fo67.9 using Vegard's law (Akimoto and Fujisawa 1968), which is in good agreement with the olivine composition (Fo71) obtained by microprobe analysis. We could not obtain good Raman data on this section due to high to extremely high fluorescence background most likely from the surface coating and contamination by the epoxy enclosing the particle. FSE image and phase map of RA-QD02-0041. The FSE image shows orientation contrast, suggesting that olivine in this particle is a single crystal. The olivine phase map shows that Kikuchi lines of yellow dots could be indexed by the olivine structure. Plag, plagioclase. We analyzed this particle only by SR-XRD because it was attached to a glass fiber and did not perform any further sample processing. We analyzed several different areas of the particle, but the obtained diffraction patterns were always identical, indicating that it is a single crystal. The obtained patterns were indexed by the olivine structure, and after the structural refinement, the following cell dimensions were obtained: a = 4.7842 (15) Å, b = 10.289 (2) Å, and c = 6.018 (2) Å. Vegard's law gave an average olivine composition of Fo69 (Akimoto and Fujisawa 1968). The chemical compositions of olivine and plagioclase in the newly analyzed particles are summarized in Table 2. This is the smallest particle among the samples we received (Table 1). It is composed of polycrystalline plagioclase grains up to 10 μm in size with a trace amount of olivine. The chemical composition of plagioclase is An13-11Or5. The Fe SR-XANES analysis of plagioclase shows the presence of two pre-edge peaks, corresponding to both Fe2+ and Fe3+. The intensity ratio of the two peaks indicates that about half of the Fe is present as Fe3+ (i.e., Fe3+/ΣFe is approximately 0.5) (Figure 3). SR-XRD analysis shows that a part of this particle is composed of multiple grains. The obtained reflections could be indexed by a mixture of olivine and plagioclase single crystals. The calculated cell dimensions of olivine are a = 4.708(15) Å, b = 10.289(2) Å, and c = 6.0240(5) Å. The average forsterite content of olivine estimated from these cell dimensions is Fo67. The plagioclase reflections gave the following cell dimensions: a = 8.194(3) Å, b = 12.893(11) Å, c = 7.23(3) Å, α = 92.6(2)°, β = 116.75(4)°, and γ = 90.03(6)°. Pre-edge portion of the XANES spectrum of plagioclase in RA-QD02-0100. Fe2+ and Fe3+ positions are from the amphibole standards whose Fe3+/(Fe2+ and Fe3+) ratios have been well determined by wet chemistry (Monkawa et al. 2006; Satake et al. 2014). The presence of two peaks corresponding to Fe2+ and Fe3+ is obvious. This particle is composed of subequal amounts of olivine and plagioclase (Figure 4). Submicron-sized Ca phosphate is also present. The boundary between olivine and plagioclase is sharp. Olivine is Fo71-70 with approximately 0.4 wt.% MnO. Plagioclase is An13-10Or6-7. Raman analysis reveals the presence of minor compositional variation of olivine. We also performed SR Fe-XANES analysis on plagioclase in this particle. The obtained spectrum suggests the presence of minor amounts of Fe3+; however, due to beam overlap with olivine, the results may be meaningless. Back-scattered electron image of RA-QD02-0133-1, showing a sharp grain boundary between olivine and plagioclase (plag). Ca phos, Ca phosphate. RA-QD02-0138 is a single olivine crystal with minor plagioclase. Submicron chromite is also present in olivine. Olivine is homogeneous with Fo70 and approximately 0.4 wt.% MnO. Plagioclase is too small to be analyzed by electron microprobe. This particle is composed of a single crystal of olivine. The olivine composition is Fo73 with approximately 0.4 wt.% MnO, which is slightly more magnesian than the other particles. The olivine is homogeneous, and we did not see clear compositional difference in this particle. The Fo contents of olivine in the analyzed Itokawa particles including new samples are all in the limited range Fo67-73. These values are close to those reported by Nakamura et al. (2011, 2014). In particular, our olivine compositional ranges are narrow (equilibrated), matching with those of ‘highly equilibrated particles’ in Nakamura et al. (2011, 2014). We did not find any ‘poorly equilibrated particles’ with magnesian olivine composition reaching up to Fo75 and mesostasis portions showing glassy textures that were reported in PE samples (Nakamura et al. 2011, 2014). In these poorly equilibrated particles, pyroxene compositions show much wider ranges than those in highly equilibrated particles (Nakamura et al. 2011, 2014), but we could not investigate this issue because pyroxene is absent in our samples. Olivine in RA-QD02-0179 has a slightly more Mg-rich composition than the other studied particles and overlaps with the range of poorly equilibrated particles. However, this olivine grain is homogeneous in having no mesostasis and unlike poorly equilibrated particles. 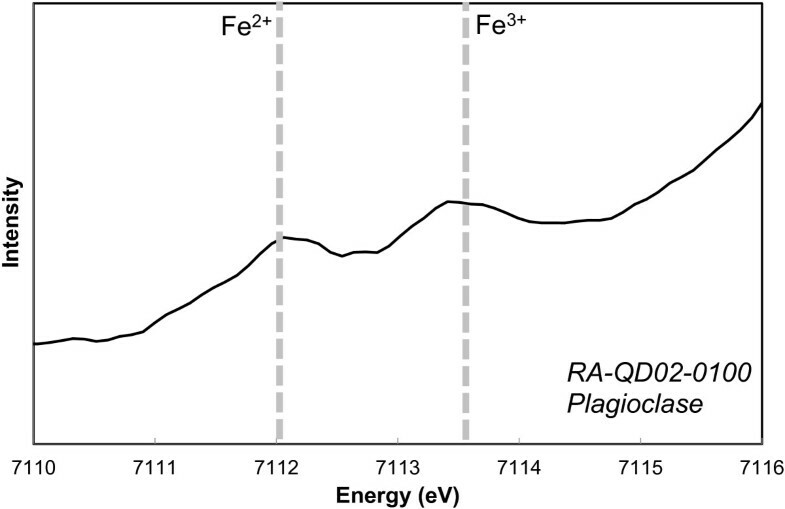 Olivine in RA-QD02-0133-1 shows a small compositional variation (Fo70-71) and similarly only minor variation in Raman spectra due to compositional equilibration. Therefore, because olivine and plagioclase are contacted by a sharp grain boundary (Figure 4), we consider that it is a highly equilibrated particle. Thus, the samples analyzed in this study are all highly equilibrated particles. The olivine composition of the particles analyzed in this study is within the range of those of equilibrated LL chondrites and clearly more Fe-rich than in L and H chondrites as pointed out by Nakamura et al. (2011, 2014). LL chondrites are the most oxidized group among ordinary chondrites, and therefore, the estimation of redox states of Itokawa particles is important to further constrain the link to LL chondrites. In this study, we found that about half of iron in plagioclase is present as Fe3+ by SR-XANES analysis. Unfortunately, we do not have available data for the Fe valence in ordinary chondrites. However, such a high Fe3+/Fe2+ ratio is known from maskelynite (shocked plagioclase glass) in Martian meteorites and is interpreted to represent the formation under an oxidizing environment (Satake et al. 2014). 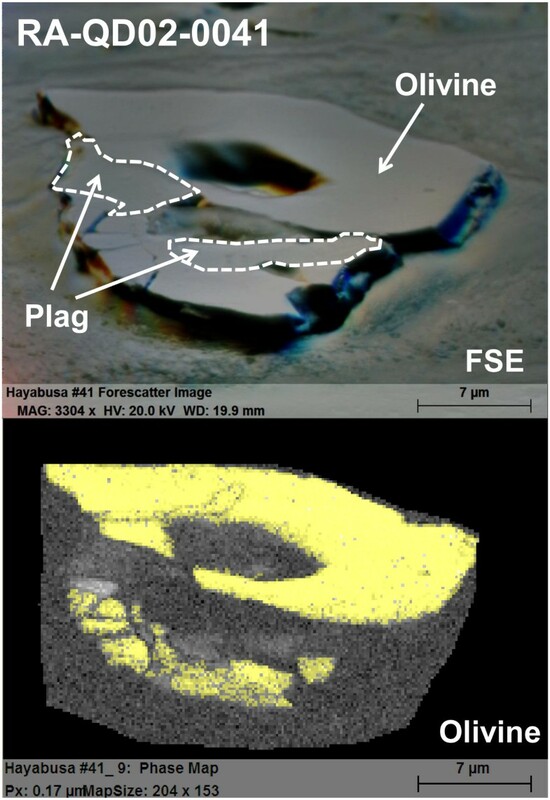 Although the plagioclase compositions are different, maskelynite in Martian meteorites is estimated to have formed at around a few log units above the iron wüstite buffer (logf O2 = IW + 2 ~ 3), where the Fe3+/(Fe2++Fe3+) ratio is approximately 0.5 (Satake et al. 2014). Similarly, Noguchi et al. (2013) reported Fe-XANES analysis of olivine in some Itokawa particles and suggested similarity to the Tuxtuac LL5 chondrite. Thus, this study further supports that the analyzed Itokawa particles belong to LL chondrites. Because the olivine composition of the analyzed particles is homogeneous, their petrologic type is ≥4. Among various criteria to determine petrologic types of ordinary chondrites, the size of plagioclase crystallites is useful to distinguish among types 4, 5, and 6 (Van Schmus and Wood 1967). The sizes of the plagioclase crystallites in the analyzed particles are >20 μm when plagioclase is present. Therefore, it is concluded that their petrologic type is ≥5 (Van Schmus and Wood 1967). The plagioclase crystallography can be used for thermometry when plagioclase is formed in equilibrium (Smith 1972), and we estimated an equilibration temperature of plagioclase in RA-QD02-0036 and RA-QD02-0100 using the SR-XRD results (Figure 1b). Similar measurements have been already performed by Nakamura et al. (2011) and Tanaka et al. (2014), but they employed a larger SR beam (0.5 × 0.8 mm). In contrast, we obtained crystallographic data from an approximately 1-μm area of the particles because of our much smaller beam size. The obtained Δ131 indices of the plagioclase crystals in both RA-QD02-0036 and RA-QD02-0100 are 1.83° after correction by plagioclase composition (An13-11Or5), indicating that their equilibration temperature was 800°C ± 10°C. This temperature is significantly higher than those of the four particles reported in Tanaka et al. (2014) (RA-QD02-0010 655°C ± 5°C, RA-QD02-0025-01 660°C ± 5°C, RA-QD02-0055 660°C ± 5°C, RA-QD02-0067 660°C ± 5°C) but close to that of RA-QD02-0013 (820°C) in Nakamura et al. (2011). Such high temperature for crystallization of plagioclase is consistent with its petrologic type of ≥5. Nakamura et al. (2011) applied two-pyroxene thermometry and obtained 780°C to 840°C. We could not do this because of the absence of pyroxene in our samples. The equilibration temperature recorded for plagioclase in RA-QD02-0036 and RA-QD02-0100 is close to these temperatures and probably records near peak metamorphic temperature as discussed in Nakamura et al. (2011) and Tanaka et al. (2014). These temperatures are slightly lower than the estimated metamorphic temperatures of LL6 chondrites (874°C to 945°C) (Slater-Reynolds and McSween 2005) as pointed out by Nakamura et al. (2011) and Tanaka et al. (2014) and probably reflect earlier crystallization of plagioclase before the peak metamorphic temperature was reached (Slater-Reynolds and McSween 2005). Optical microscopy reveals that the analyzed Itokawa particles experienced only minor shock metamorphism corresponding to the shock stage S2 (very weakly shocked). This observation is consistent with other analyses. For example, the SR-XRD analysis of all the analyzed particles gives sharp diffraction spots from both olivine and plagioclase (Figure 1). Similarly, Raman peaks are sharp, and most obtained Kikuchi lines by EBSD analysis could be well indexed by olivine or plagioclase structures (Figure 3). All of these observations indicate that at least the Itokawa samples we analyzed have not experienced strong shock metamorphism, although highly shocked ringwoodite-bearing LL chondrites and complex LL chondritic breccias are known (e.g., Bischoff et al. 1993, 2006; Jamasja and Ruzicka 2010). We studied three PE and four new Itokawa particles returned by the Hayabusa spacecraft and found that they are composed of olivine and plagioclase with trace amounts of Ca phosphate and chromite. We did not find any pyroxenes in our samples. All these particles show minor undulatory extinction of olivine and plagioclase, and the estimated shock stage is S2. This low shock degree is consistent with the observations by SR-XRD, EBSD, and Raman analyses. The olivine compositions in the analyzed particles determined by electron microprobe analysis and SR-XRD show a narrow range (Fo70-73), corresponding to those of the LL chondrites. Because of the equilibrated textures and mineral compositions, we conclude that they are equilibrated LL chondrites. In particular, the presence of plagioclase whose grain size is larger than 2 μm suggests a petrologic type of ≥5. This highly equilibrated nature is consistent with the relatively high equilibration temperature (800°C ± 10°C) recorded by plagioclase as deduced from plagioclase crystallography determined by SR-XRD. Our SR-XANES analysis shows that Fe in plagioclase in studied two Itokawa particles is present as approximately 50% Fe3+ and approximately 50% Fe2+. Such high Fe3+/Fe2+ ratios suggest high oxygen fugacity, which is in good agreement with its classification as LL chondrites. Thus, this study has further confirmed that Itokawa particles are likely to belong to only slightly shocked equilibrated LL chondrites as suggested by the PE studies (e.g., Nakamura et al. 2011). We did not find any exotic components that have not been found by the PE study. The presence of equilibrated LL chondrite particles on the surface of Itokawa shows that the original parent body of Itokawa was much larger and that Itokawa is a daughter body with rubble-pile characteristics composed of equilibrated fragments once located in the deep interior of the original parent body as suggested by Nakamura et al. (2011, 2014). We thank JAXA for providing us with the Itokawa particles. Advice for the sample preparation and discussion with Dr. T. Nakamura was very helpful. We are grateful for the constructive reviews by Drs. A. Bischoff and T. Nakamura, and editorial handling by Dr. T. Okada. The electron microscopy was performed at the Electron Microbeam Analysis Facility for Mineralogy at the Department of Earth and Planetary Science, University of Tokyo. A part of this study was supported by the Grant-in-Aid for Scientific Research (B) by the Japanese Ministry of Education, Culture, Sports, Science and Technology No. 23360333 (TM). The SR-XRD work was supported by the SPring-8 long-term project (2010B1415) and SR-XANES work was by KEK 2012G652. MEZ was supported by NASA's Muses-C Program. TM carried out the sample preparation, OM observation, SR and electron beam analyses, and drafted the manuscript. MKo helped in sample preparation and was involved in both SR and electron beam analyses. KH carried out the SR-XRD analysis and performed its data reduction and crystallographic calculation. KO, YT, NY, and MT participated in the SR-XRD analysis. MEZ performed electron beam and SR-XRD analysis and helped draft the manuscript. VH, RH, and MKa performed the Raman analysis. JM performed the EBSD analysis. WS, YA, and AT participated in the SR-XANES analysis. YK, MU, and TY performed sample preparation. All authors read and approved the final manuscript.